If you are looking to purchase new kitchen cabinets but are on a tight budget, then find out why you should go with Ikea cabinets over Home Depot or Lowe's cabinets. 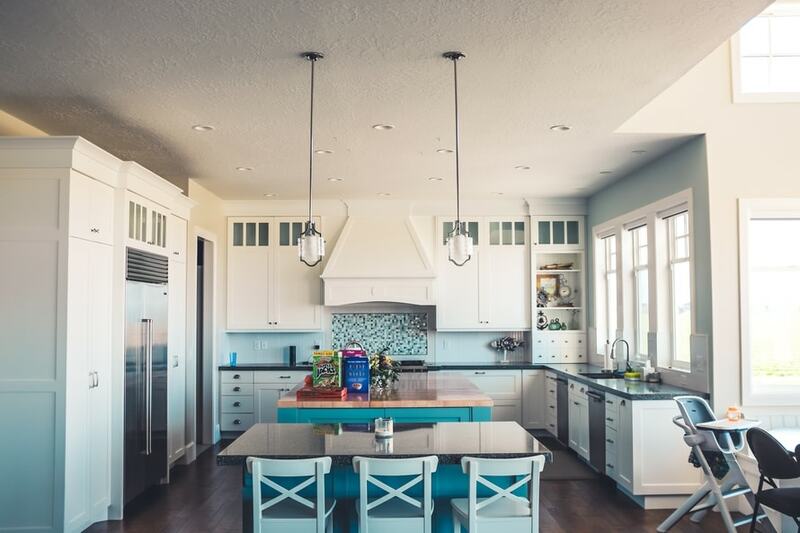 If you have ever remodeled a kitchen or are considering remodeling soon, then you know how stressful it can be to pick the right cabinets. Cabinets are the biggest expense for a kitchen remodel, so you don't want to mess them up or get the wrong kind. We are preparing for a kitchen remodel soon and we read and researched cabinets for months and narrowed down our final choices to Lowe's, Home Depot, and Ikea. After lots of talking, web searching, store hopping, and stressing, we finally decided to go with Ikea cabinets in the end. We considered Home Depot and Lowe's, but Ikea won our vote for several, key reasons which I'll talk more about. If you are on a tight budget, then you will get the biggest bang for your buck at Ikea. Lowe's and Home Depot offer box cabinets for similar pricing to Ikea's cabinets. These box cabinets you find at Lowe's and Home Depot are pre-built. 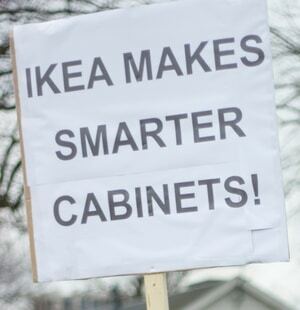 However, they are not made with as high-quality materials as Ikea's cabinets. Ikea builds their cabinets with thicker bases and you can choose extremely durable faces for your cabinets. In addition, there are standard additional features for Ikea cabinets which I'll talk more about later. We chose a high-gloss turquoise cabinet for our kitchen. We chose high-gloss because they are scratch resistant and easy to clean. In addition, the turquoise will look fantastic with our white walls and light backsplash. You do need to know that Ikea's Sektion cabinets are flat packed - meaning you will need to build them or find someone to build them for you. Personally, I would rather build them myself and know they are built well and to my standards. When we went to Ikea, I was simply blown away at the quality of customer service they offered. After interacting with a handful of employees, I couldn't find a single disgruntled or grumpy worker. They were all willing to help us find what we need. The lady who helped us finish plan our kitchen even stayed past her shift to help us! When we wanted a different color cabinet piece, they made sure we got just the right color - and quickly too. All of the employees were happy, helpful, and more than willing to answer all of our questions. I've never had a favorite retail store, at least not until now. Ikea is now officially my favorite retail store, and I'm not even ashamed to admit it. I even received a survey to fill out from Ikea. I never fill out surveys, but I filled out this one because of the top-notch customer service Ikea offers. Another reason Ikea is amazing is because every Ikea is essentially a showroom and a warehouse. What that means is you go into Ikea and will more than likely walk out with what you planned on buying. For example, Ikea had all of the cabinet supplies we ordered already in stock except for 3 pieces. I was actually pretty happy they had a few pieces out of stock because there was literally no extra room to pack more cabinets into our little car! Fitting 13 flat-packed cabinets into a Chevy Sonic is quite the feat. Let's just say we're experts at Tetris now. For those 3 pieces they didn't have in stock, they said they could ship the order directly to our house in less than a week. We only paid $9 for shipping and it did indeed arrive in less than a week to our front door. Overall, the whole process of buying cabinets from Ikea was so easy and convenient. We had a pre-made model of the kitchen plan we wanted using Ikea's Kitchen planning software. When we arrived at the store, we made it to the kitchen section and a nice lady reviewed our plan and bettered it. The overall planning time only took 45 minutes or so in-store. It went smoothly because we went in prepared with our plan. I've heard people say that Ikea meatballs are good. But, man oh man, they really are so good! I was amazed at how good they actually taste. I would almost drive the hour and a half to Ikea just for the meatballs. After eating, we waited about another hour while they finished gathering our order. Once the order was gathered, we loaded everything up into our car and we were off. From start to finish, the whole process only took 3 hours - which is amazing considering we planned, purchased, ate dinner, and left with the cabinet supplies during that time. It's a great feat that neither Lowe's or Home Depot can provide. So far, I am more than impressed with our purchase from Ikea. All of the supplies are solid and well packed. There will be a learning curve to assemble the cabinets. I'm excited and anxious to start building them. In addition, I likely will say a few, choice words when I assemble the first couple of cabinets. I think I'll get the hang of building them after the first or second and then I'll be an expert. If you are considering which cabinets to buy for your kitchen remodel and you're on a tight budget, then I strongly recommend Ikea cabinets. You will be impressed at the quality of cabinets you receive for the price. You'll experience above-average customer service and the experience will be relatively painless. And in the end, you get Swedish meatballs and good food. What more could you ask for?